I was born the youngest of 10 children, 5 Boys and 5 girls. My Parents were William and Isabella Jolley. We lived in number 13 Henrietta Street and my parents met each other while living in Henrietta St. They fell in love and got married in 1928 in St. Michan’s Church, Halston Street, Dublin. I recently found out on a visit to Glasnevin that my father’s parents John & Maria Jolly passed away within days of each other while living in number 13 Henrietta St in 1913. My Parents had a wonderful happy marriage and loved each other very much. As a small child I remember every Sunday afternoon they would move the table we had the in centre of the room and they would put on old records and waltz. My Mam loved to dance and would show me how to do the Charleston. My Mam’s parents also lived in number 13, they were John & Catherine Horrigan. John served in The 8th Battalion Royal Dublin Fusiliers and fought in WW1 in The Battle of Passchendaele. He was one of the lucky ones, he returned home alive but not before spending 2 years as a Prisoner of War in Germany. My grandmother Catherine was known by all who lived in Henrietta St as ‘Mother Horrigan’. She had a great friend Nell Hanratty who lived in number 6 Henrietta St. and the two of them would sit on the steps of number 6 and put snuff on the back of their hand and sniff it up their nostrils. I love Henrietta Street with a passion so strong and that is what prompted me to set up my Facebook Group ‘Henrietta Street, Dublin: The Jewel in the Georgian Crown’ . I had such a happy childhood with lots of great friends who lived there and we would play out on the street as soon as we got home from school. I went to Georges Hill presentation Convent in the Market area, and made lots of friends there who lived around Hentown (what Henrietta Street was known as to residents). Setting the group up was just fantastic as it has brought me back in touch with so many people & friends from my childhood. Some I lived with in Henrietta St., some I went to work with, and some I went to school with. I also found my long lost cousin’s sisters, Theresa, Marie, Eileen Tierney! I lost contact with them when their mother passed away in 1961 and they were put in a home for orphans! Theresa is an administrator on the Facebook Group and all 3 girls are also on it. I met up with Theresa last year when I was in Dublin. We had not seen each other since we were children. I’m also now back in touch with other cousins. I have met up with several people from my past like Ken Donohue whose Family owned the Pub at the Bottom of Henrietta Street. It was then called Donohue’s and was the hub of the area were a lot of people went to socialise … a ‘Rovers Return’ of its day. I would love to organise a day when most members of the group could get together in Henrietta Street. I could go on forever telling you what a wonderful street it was to grow up in. People really did care for each other and share things when times were tough, and we could go out and leave our doors unlocked and have no worry about being broken in to. Also the Temple Park at top of the street was a great place to play in. Oh! All those wonderful hot summers spent with my friends! Front row from the left my dad William, me! (Trish Jolley-Nunes), brothers Eddie,Bill, Patrick, and Robert. Back from the left my sister May Jollley-Wheeler, my sister in law Juliann Jolley, my mam Isabella and standing in shorts my brother-in-law Johnny Wheele. 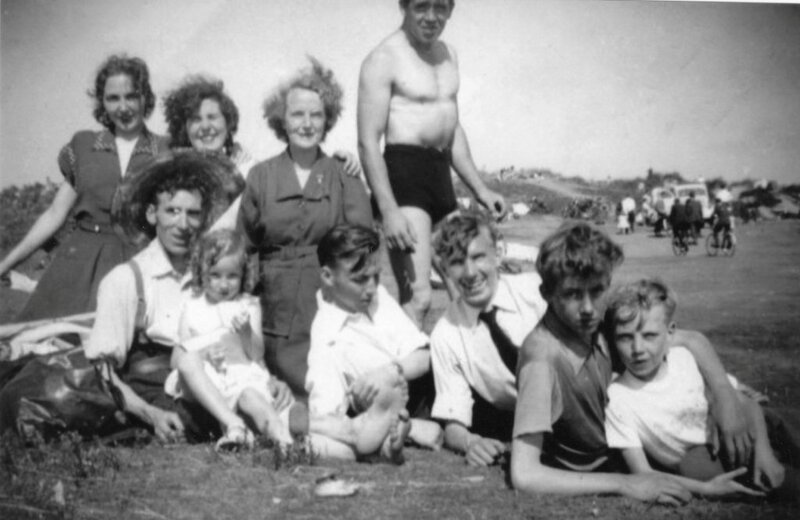 Taken at Portmarnock Beach 1954. My brother John took photo, my sisters Ann, Honora, and Isabella are not pictured. This entry was posted in Henrietta Street History, Living the Lockout Project, Tenement History and tagged Dublin Tenements, Dublin: The Jewel in the Georgian Crown, Facebook, Family History -- Ireland, Henrietta Street, Henrietta Street -- Dublin, Irish History, Social History--Ireland, The Jolley Family. Bookmark the permalink. My Great Gran lived in number 7 and I lived in number 4 until I was just five years old and still remember living there! Loved Henrietta street and can still remember crying the day we moved out. Thanks for the interest! And thanks of course to Trish for sharing her history with us. Hi Leonie, i remember your great Aunts May & Connie Marshall ! i was told they were very good to my Dad when he was very ill and helped my Mam to look after him! They made lovely cakes and kept them in a beautiful cake tin & would invite some of the children in to have Tea/Cakes. My great grand parents both lived in 14 henrietta street the oglesbys and carberrys my nanny was born there in 1920 then moved to colraine street church street and finaly bowe street when she got married unfortunatly she is bedridden at the moment but i would love her to see no 14 again we my aunts and my family will deffinatly try and make it on the 25 august i think it would be so interesting to see where we came from. my nannys dad and mam lived in 14.13 and my grandads dad and mam lived in 14.16 in 1911 did you ever here of catherine oglesby ? or the brennans or carberrys ? Id love to know if you knew my nanny . Hi Jacqueline, I dont know your family but if you join my facebook group ‘Henrietta Street Dublin The Jewel in The Georgian Crown’ their might be some people of there who might remember your Family.you are most welcome to go to The Gathering on August 25th. lookforward to you been there! Hi just joined Facebook ,I lived in Henrietta Street around 1938-19441 ,my Name Tom Cullen ,my paternal grandparents also lived there .I loved it when the horse drawn bread cart arrived .The Temple a great place to collect caterpillars .